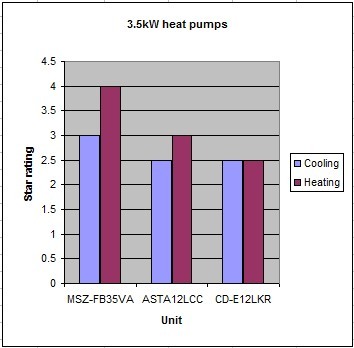 Heat pumps can be thought of as a heat engine which is operating in reverse. One common type of heat pump works by exploiting the physical properties of an evaporating and condensing fluid known as a refrigerant. In heating, ventilation, and air conditioning (HVAC) applications, a heat pump normally refers to a vapor-compression refrigeration device that includes a reversing valve and optimized heat exchangers so that the direction of heat flow may be reversed. Most commonly, heat pumps draw heat from the air or from the ground. 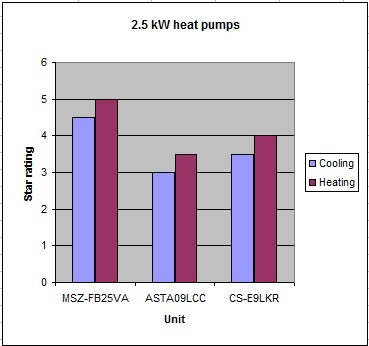 Some air-source heat pumps do not work as well when temperatures fall below −5 °C (23 °F). An air conditioner heat pump with an inverter is one of the most efficient forms of home heating. They work by moving heat from outside a dwelling to the inside (and vice versa for cooling), rather than by directly converting electrical energy to heat. Many of heat pumps now use the R-410A refrigerant gas, which does not contribute to ozone depletion, but it has a high global warming potential (1725 times the effect of carbon dioxide). It is important that this gas is captured when units are serviced or decommissioned. The efficiency of these units for heating and cooling can vary significantly between manufacturers and models, so check their energy ratings carefully. Also note that that the Australian energy rating system for heating and cooling appliances changed in 2010, so it is worth double-checking the energy rating information. Heat exchangers are up to 6 times more efficient than appliances that directly convert electricity into heat energy, as they are moving heat around rather than creating it. Strict energy standards should apply to which models are available for sale (e.g. 3 star minimum). For example, in Australia landlords will often buy a cheap heat exchanger that has a poor energy rating as they do not pay for the power bills. This page was last modified 01:49, 9 June 2011.